You may be obliged to delete personal data you hold under GDPR. 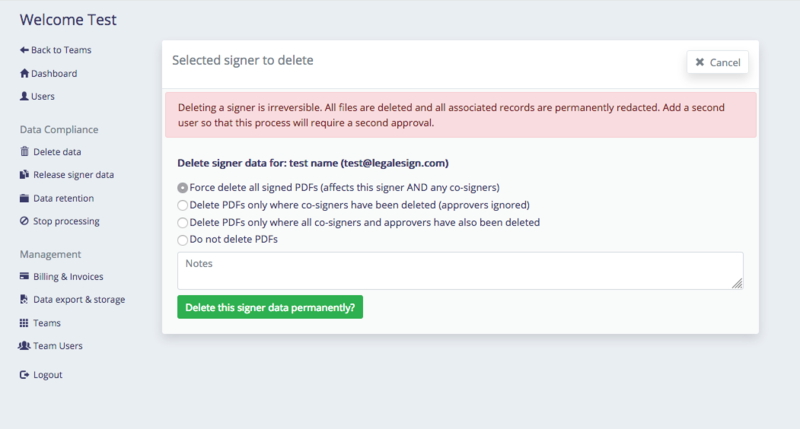 Use this feature to delete signer/approver data. Go to the Organisation/GDPR webpages and click 'Delete data' in the left-hand column. In the centre column you will have the option to enter the email or last name for the person and search for them. Select the person from the list of results. You will be offered a series of options on how far you want to remove data. For example, you may need to delete a document only signed by the person, but if that document has been signed by others you may wish to keep it. The options give you a series of choices to cover those situations. Optionally add any notes you wish to record against this deletion. After you press save everything will be removed and each of those will be logged. While files will be entirely deleted, the relevant database records will be wiped of personal data, but the record itself will remain, with entries marked as deleted. If you have the correct permission you can also delete an individual document record by going to its details page within the team, you will see there a Delete button.